We are an eclectic group who are all enthusiasts about our local heritage and enjoy helping others to appreciate it. Between us we cover all Calderdale (and a few enclaves just outside the District). Each year we offer several new walks and each will have involved 50+ hours of research. Even then, new details come to light, buildings are altered, or other things happen, so updating is an ongoing process. Many of the team are also involved with local history societies, writing about history, research projects, giving talks or running educational courses. We're busy people ! John is a librarian specialising in folklore, curiosities and prehistory. He edits the antiquarian magazine 'Northern Earth' and has written several books on local topics. He is Programme Secretary for Hebden Bridge Local History Society and specialises mainly in walks around there. Jo is an experienced walk leader based in Hebden Bridge who will be concentrating on walks in the central part of Calderdale. John is a retired Headteacher with a longstanding interest in local history. WEA lecturer and co-author of a school history. Devoted to cricket and is secretary of the History Society in his home area. His walks tend to be east or north of Brighouse. Iain is also retired from teaching and now very actively working to improve Calderdale's countryside and its facilities. His main areas of interest are the outer suburbs of Halifax and the villages just west and south-west of there. David's particular interests are buildings and industrial archaeology. Currently involved in transcribing probate documents for the old parish of Halifax and working to make archive documents on Yorkshire buildings, craftsmen and their patrons more widely available through digitisation. Anne is an enthusiastic local historian, lecturer, former nurse and motor cyclist. Her walks tend to be mainly in and around the Ryburn Valley area where she lived for many years, or in Halifax. Jill is a historian, writer and academic with a particular interest in women's suffrage and the wider issues relating to women's history. She has lived in the mid-Calderdale area for some years and has also led longer countryside walks for two local organisations. Anne Mealia is a professional genealogist and family historian specialising in Yorkshire and Lancashire research. She teaches family history courses and is on the committee of Hebden Bridge Local History Society. 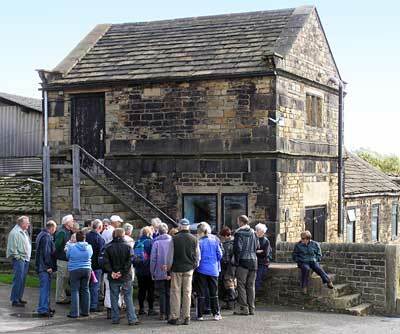 She leads Heritage Walks in the western end of the Calder Valley. After many years working in Countryside Management and recreational use of the countryside, David returned to his earlier love of local history – particularly related to industry and technology. Specialises in the east of Calderdale plus Halifax, but with occasional forays elsewhere. Margaret is another former teacher, she takes a major role in the Kirklees Estate walks but is also involved in Halifax and Brighouse sites from time to time. Has a wide range of historical interests from medieval to early 20th century. Ian is another retired headteacher but don’t let that put you off. His areas of interest include Hipperholme, Lightcliffe, Brighouse, Rastrick and Elland where he grew up. He has been heavily involved recently in the restoration of a local churchyard and the development of its comprehensive website. He’s also involved in Lightcliffe & District Historical Society. Margaret trained as a teacher and is a local historian with a particular interest in Brighouse and surrounds. She’s written books on that area, given lectures and led walks for local societies. So Initially she’ll concentrate on that area. Mary concentrates on the far north-east of Calderdale (and just beyond). A family historian whose interests have spread to population studies and the area in general. Currently working on a detailed study of certain woodland areas and former iron works locally.